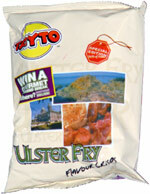 Taste test: These chips were supposed to simulate the taste of an Ulster Fry. I checked around with a Google search and found out that an Ulster Fry is an Irish breakfast that combines eggs, sausage, tomato, black and white pudding, bacon, and bread. Apparently, it's sometimes known as a "heart attack on a plate." Not having eaten an actual Ulster Fry, I can't say whether these chips matched the taste, but I can say that they tasted good. 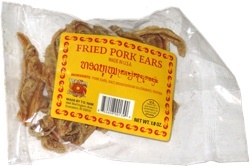 They had a tangy, spicy flavor that sort of burned the tongue a little. Smell test: Hard to describe. A mildly spicy smell.